Happy Friday! It is certainly beginning to look a lot like Christmas all around. So, it seems like a good time to break out some reindeer jokes and if a reindeer was telling going to tell you this jokes he might preface it by saying that these will “sleigh” you! Why don’t you see many reindeer at the zoo? They cannot afford the admission price! 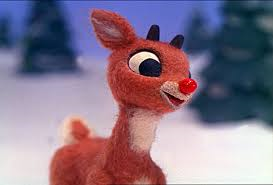 What does Rudolph want for Christmas? A pony sleigh station! What’s red and green and guides Santa’s sleigh? Rudolph the red-nosed pickle! Did you hear that one of Santa’s reindeer also works as a maid? Yup! Comet, he cleans sinks! How do you make a reindeer fast? Stop feeding it. Why do reindeer wear fur coats? Because they look silly in snow suits! Did Santa’s reindeer go to school? No, they are “elf”-taught! What do you give a reindeer with an upset tummy? “Elk”-a-seltzer! How do you get into Donner’s house? You ring the “deer”-bell! What’s red and white and gives presents to gazelles? Santelope! How many reindeer does it take to change a light bulb? Eight! One to screw in the light bulb and seven to hold Rudolph down! Which reindeer has the least popular holiday get together? It has to be the Donner party. This entry was posted in Friday Funny, Humor and tagged reindeer jokes on December 10, 2015 by Leonard.